As part of our regular review process Headteachers and PE subject leaders from across our 29 Option 3 primary schools were invited to comment on the impact of our Mentor programme during terms 1-3 2015-16. 90% of schools responded to the survey including 86% of PE subject leaders and 31% Headteachers. A summary of the survey responses can be found at the bottom of this page. Dr Radcliffe’s: I only disagree with the last question (programme has helped to increase participation in level 1s) because we already had a good programme of level 1 competitions prior to starting the mentor programme. Karen is amazing. She adds such a lot of value to our team and it is great to see the benefits to the children and staff! Seeing the Year 5 play leaders leading games on the playground is great. I really value this support. St John’s: A very successful year. The programme has really helped my new PE Coordinator to settle into her post. Thank you! More of the same please. I love the enthusiasm of the NOSSP team which is infectious. The Grange: The profile of PE and physical activity has increased tenfold at The Grange. Relationships between NOSSP staff and school staff have been outstanding. The % of children accessing festivals and sports clubs has been very high and inclusion of all cohorts of pupils has been very good. The organisation of the sporting events is very good and pupils are enjoying taking part in the planned activities. Wroxton: New staff to school and so support for those members of staff has taken place initially. OFSTED commented positively on the impact the funding has had for our school. This term although only just begun has seen a member of staff coach a mentor absolutely fantastic for their confidence. Brookside: Our involvement with NOSSP has raised the profile of PE across the school. Teachers have greatly benefited from working closely with our PE mentor which has increased their confidence and knowledge of how to teach PE. This has improved the quality of our PE provision across the school. In addition, the opportunity for involvement in sports events across the partnership has been beneficial to all of our pupils. Rory has been an excellent mentor and we hope to continue to work with him in the future. Under the leadership of Carl Hamilton I feel the programme runs exceptionally well and does not need any improvement. Five Acres: Staff more confident, children making better progress. William Morris: More children are joining in with PE lessons than before. When asked why it’s because they have become more fun. Brookside: Our mentor has delivered a gym inset and all staff has given positive feedback and was very enthused by the staff meeting and was eager to try out the different ideas that Rory has given us. Orchard Fields: The mentor has introduced level 1 ideas at the end of units such as a house gymnastics competition for year 6 where children were also awarded certificates linked to the sports values. She has supported our staff when running after school clubs, which have been targeted towards focused groups e,g girls football and dance. Christopher Rawlins: Increased teacher confidence - working alongside mentor has developed ideas for differentiation and delivery of high-quality PE for all. Dashwood: Teachers who used to hate P.E now love it thanks to the mentor. More P.E is taking place across the school. Enthusiasm about P.E has increased. Our curriculum maps have been changed and improved to ensure more even skill specific coverage. Planning is more comprehensive and appropriate. Suggestions for level 1 competitions and help to run them. A maths booster through P.E intervention has proved successful. We are currently trialling 'naughty boys boot camp' to see if P.E can improve concentration and focus during core subject lesson time. The mentor has advised about how to measure the impact of this intervention as well as creating a quick and relevant questionnaire in google docs. 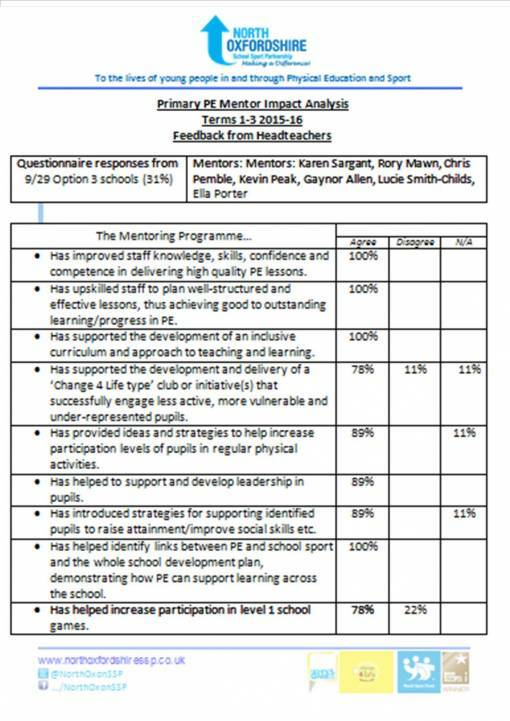 West Kidlington: Although I have ticked the agree box I don't really have any 'proper' evidence to say that the mentor programme has led to high quality P.E and good to outstanding learning / progress. I need to do more lesson observations (maybe with the mentor's help) or get the mentor to observe the teacher they are working with. The mentor has started to help me look at assessment so we can measure progress but I hope to schedule in some time next term to look at this further. St John’s: Every teacher gives really positive feedback during and after they are supported. Gain in confidence with the subject and appreciate the ideas and plans shared with them. Therefore improving their PE teaching to immediate effect and in the future. Thank you! St Leonard’s: The mentor has supported our new PE subject leader to make an excellent start in her new role. It has developed her overview of PE provision and enabled her to plan for St Leonard's participation in partnership sports events. The mentor has also supported in the improvement of teaching and learning in PE by modelling good practice for teachers. Cropredy: We have been extremely lucky to have worked with some fantastic mentors, this year is no different. As a school we are very happy and have enjoyed working with our mentor. They have helped to upskill our staff and ultimately helped to make PE teaching and learning at our school reach higher standards. Edward Field: This year we have had fantastic support in our school with EVERY teacher having had expert coaching/planning/delivering support. ALL our teachers have learnt so much in a short space of time and gained great confidence. Please can we keep our PE mentor! Glory Farm: The mentoring programme has not only supported staff in the planning and delivery of P.E in school, but increased their confidence and enjoyment in the subject. Karen is flexible and supportive to all the staff, not only the one's she is working with that term alongside feeling part of our school team. Karen has also worked for a number of terms with our inclusion team to run lunch time clubs for our SEN and less active children, which they have thoroughly enjoyed. It has also helped staff who work with these children to understand how to continually develop their physical literacy. As an NQT last year, Karen supported me hugely with the subject knowledge and now continues to support me as the P.E co-ordinator. She has run a CPD staff meeting on gymnastics and is working with the school to create a range of gymnastics resources. North Kidlington: Kevin has had a positive influence on the members of staff that he has worked with in the last 3 terms. He has also trained up our young leaders ready for lunchtime clubs, starting next term. We are grateful for all the work that he has put in. Hornton: Great for just providing different ideas for simple activities such as warm ups. Also been useful to get an idea of how to progress from a basic skill to a game situation (as appropriate). Hardwick: Always professional! Works well with all staff and the children. Supported changes to current assessment program. Increasing level 1 competitions. Supporting KW with paper work as well! Longfields: We have had a really successful time within the mentoring programme. With our mentor, the PE coordinator has been able to develop and monitor high quality PE in the school, provide assistance and resources for staff and make others aware of the cross curricular benefits of PE within the whole curriculum. We have improved our PE and sport enough to achieve the YST Silver award and the School Games Bronze Award, which we previously had not attained, we are also currently looking at what we need to do to achieve the next level for both of these awards. We have also developed a C4L club, play leaders and sports organising crew within the school to help give the children more ownership of port within the school. Fringford: Our PE lessons are so much better than they were because of this programme. I also love the competitions run by NOSSP and the kids enjoy them so much! Dr Radcliffe’s: Our PE Mentor has worked with teachers throughout the school, who consistently feedback that they been helped to develop their teaching and planning in PE. Our Mentor, Karen has also been extremely helpful to me as subject leader in helping to develop a new curriculum map for PE, organise events and meet the standards for the School Games Mark. She has also led young leader training to involve the children in developing their leadership skills. William Morris: Our mentor has supported us with planning, assessment and implementation of lessons. They have given the confidence to staff to have a go and have demonstrated good quality lessons. St Edburg’s: Ella’s work with staff at St. Edburg’s has been instrumental in increasing their confidence in certain subject areas in PE, as well as the teaching of PE in general. Partner teaching, modelling and planning with Ella has ‘upskilled’ teachers and the children have benefitted from this hugely. Bure Park: Staff that have worked with our P.E mentor so far feel more confident in delivering P.E lessons. They have an increased bank of ideas to use and have developed their knowledge particularly in gymnastics where they felt less confident. The P.E mentor has shared strategies for differentiation in P.E, demonstrating how to organise differentiated dodgeball competition. This has given staff ideas for further differentiated competitions. It has also further focuses thought on BT children and as a result P.E booster sessions have been undertaken. The Grange: Our mentor has had a really positive impact on our school. He has a can-do attitude and works well with all staff and students. The 'up-skilling' of teachers planning and provision for PE has been particularly important and effective. Finmere: The pupils across the school have made great progress under the direction of our mentors. My staff are well supported, encouraged and challenged to raise their level of knowledge and develop key skills that support their continued CPD. Wroxton: It has given teachers who are not PE keen/aware new ideas and confidence.